The Fabriq Chorus is a mid-sized, portable Bluetooth speaker that taps into the Amazon Alexa voice assistant. If you want a purpose-built music machine that also happens to have support for voice-activated commands, the Chorus tackles both. Amazon's Alexa personal assistant has spent the better part of the last year expanding into all sorts of products. Not only is it featured in Amazon's own Echo-branded devices, but Alexa is now available to smartphones, headsets, speakers, and more. No matter the hardware involved, Alexa pipes up when asked and will tell you about the weather, traffic, and news, as well as let you set timers and spin your favorite playlists. Fabriq's latest Alexa-compatible speaker, the Chorus, is larger than its puck-sized predecessor and offers bigger sound. Other improvements are afoot that take Fabriq to the next level. 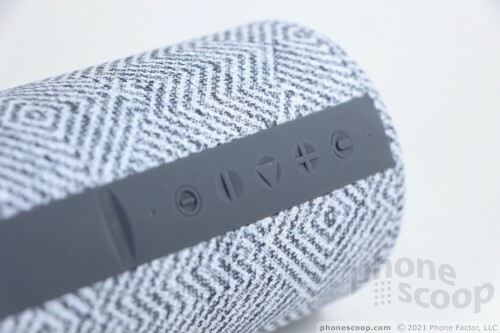 Here are our thoughts on this new smart speaker. 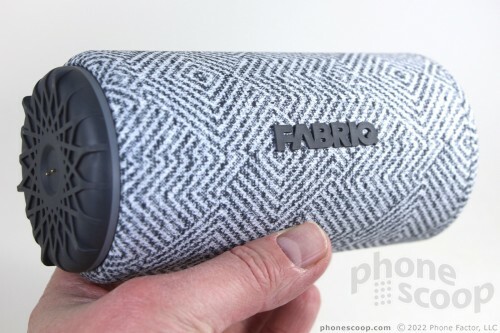 The Fabriq Chorus is a cylindrical speaker similar in size and shape to the Ultimate Ears Boom. It has a diameter of 3.15 inches and a height of 6.3 inches. 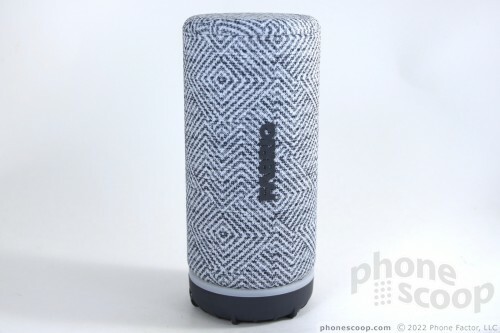 I am a fan of the cylinder shape taken on by many of today's Bluetooth speakers. 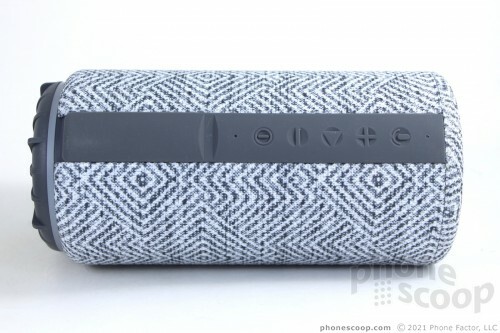 Like the original Fabriq, the Chorus offers several fabric coverings to help give the speaker some visual personality. Our review unit is rather staid with a gray, diamond-patterned sleeve, but the blue plaid and pink speckled paint sleeves are more unique. 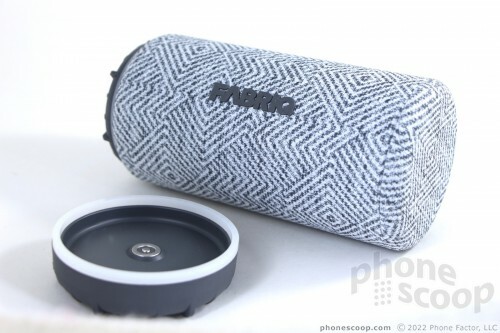 The fabric cover feels nice and gives the speaker plenty of friction in the hand. The Fabriq Chorus is a fine size and weight (1.2 pounds). It will fit into a backpack or decent-sized satchel for traveling around town, but probably not a purse. 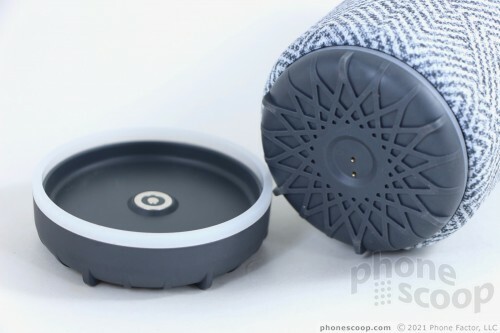 The speaker's base is made of hardened rubber. A white ring splits the fabric upper body from the rubber lower base. The ring lights up a handful of different colors and serves as a visual cue when the speaker is active, connecting, and so on. 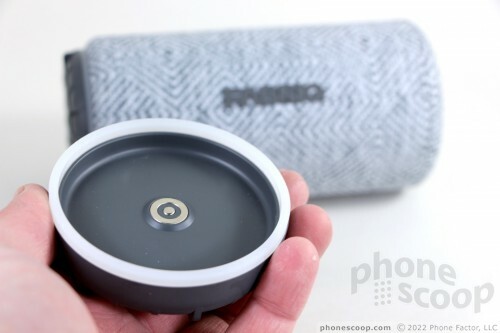 The ring is a carry-over feature from the original Fabriq speaker and I really like it. A large rubber column runs from top to bottom on the rear side of the Chorus. This is where you will find all the controls, including volume up, play/pause, volume down, and power. These buttons are indented just a bit. I can't say they are easy to differentiate by feel, but you'll learn which is which based on location after using the Chorus for a while. A quick press of the volume keys adjusts the volume, and a long press skips forward or backward a track. Below these buttons you'll note a thick rubber flap covering the ports and other controls. Pull the flap back to expose the microUSB charging port and two programming buttons. The top button is only needed when initially pairing the Fabriq to your WiFi network, while the bottom button turns on/off the Alexa mic. The buttons are small and in a recessed panel, so there's no pressing them by accident. The Chorus also includes a pin-sized opening for resetting the device to factory settings using a paperclip or SIM tool. All of the controls function well enough. The Chorus throws a charging dock into the mix and I rather dig it. This small circular base accepts a microUSB cable on one side. 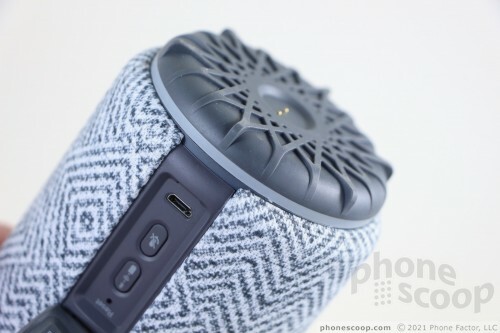 A set of contacts sits in the middle of the base and they line up with recessed charging pins on the bottom of the speaker. Drop the Chorus into the base and it will immediately start charging. Cool. I didn't run into any usability issues with the hardware. The one bummer is that the Fabriq Chorus is not waterproof or rugged in any way. I mean, you can drop it on the floor at home and probably not worry, but you can't beat it up with a hockey stick. Definitely keep it away from the pool. You need to have an Amazon account, preferably Amazon Prime, to get the most of your Fabriq Chorus. The first step is to download, install, and configure Amazon's Alexa app on your smartphone (Android or iOS). Once you've set some basics for Alexa and linked it to your Amazon account, you also need to download and install the Fabriq app. Fabriq's software is required to set up the speaker and link it to Alexa. You do not need to have an Amazon Echo device. Your phone can talk to the Fabriq directly via Bluetooth or WiFi. The Bluetooth radio works well. I didn't run into any trouble pairing via Bluetooth for basic music playback. Using my phone's Bluetooth menu to connect to the Chorus was easy enough. Music playback worked reliably over a distance of 30-ish feet. The Chorus includes Bluetooth 2.1, so only basic playback features are supported. Like the original, the Chorus requires a 2.4 GHz WiFi network to operate in Wi-Fi mode. If your WiFi hotspot only supports 5 GHz, you'll be out of luck. Most WiFi routers include both frequencies so I'm guessing most people shouldn't run into trouble. The Chorus can talk to other Fabriqs when they're all on the same WiFi network and deliver multi-room audio (but not true stereo). You can chain together up to 10 Fabriq-branded speakers via the app. I was able to pair two for testing purposes and can verify that this feature works well. One of the biggest improvements the Chorus makes when compared to the original Fabriq speaker is the always-on microphone. Just as if it were an Amazon Echo, you can simply say "Alexa" to wake the voice assistant on the Chorus. That's a huge upgrade. You have the option to turn off the always-on microphone feature. This saves battery life a bit. It might also ease your mind if you're particularly nervous about privacy. If you turn the microphone off, you'll need to press the mic button on the Chorus to speak to Alexa. The Chorus includes far-field microphones that are able to hear you from a significant distance and over the music. It easily heard me despite the fact that it was blasting some Metallica. This is vital, in case you need to tell the speaker to be quiet or make some other request, such as answer a phone call. If you leave the Chorus in its charging dock, you can leave the speaker (and Alexa!) on all the time. Alexa still does require WiFi. It won't work over the Bluetooth connection through your phone. As long as your phone and Fabriq are operating on the same WiFi network, you're good to go. That means you can tap into Alexa from your backyard or any room in your house, but not at the local park or anywhere away from WiFi. This limitation continues to be a bit of a bummer. The Chorus let me tap into all the Alexa features I'm used to using. I called up music, set timers, queried my calendar, asked for lame dad jokes, ensured Alexa knows how to math, sought out science facts (did you know the Earth is 93 million miles from the sun?) and much more. Alexa is Alexa. Some oddities: Voice-based music playback is only available from Amazon Music, iHeartRadio, and TuneIn radio. You can ask Alexa to play songs from these services with your voice, and Alexa will comply. If you want to use iTunes, Google Play Music, or Spotify, you'll need to control the music directly from your phone. The music will still play via WiFi when at home, but you can't ask Alexa to play songs from Spotify using your voice. 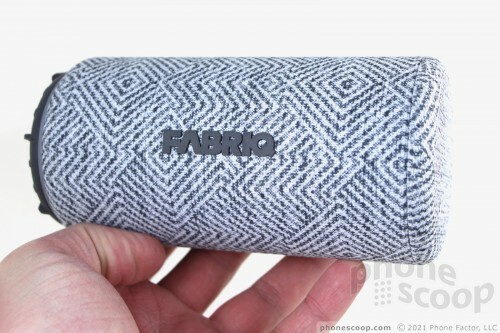 Apart from the Alexa integration, the Fabriq is an average Bluetooth speaker. I was expecting it to be a bit better. 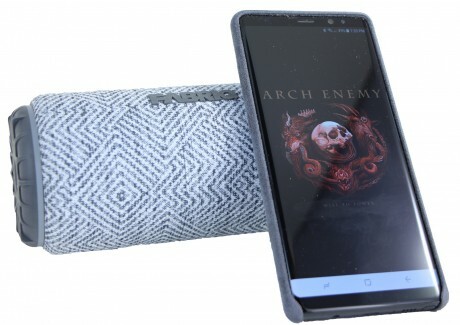 The device contains two 2-inch drivers, plus a 2-inch passive woofer. These are powered by an 8W amplifier. The Chorus can play music incredibly loud. There's no doubt the Chorus can fill a small apartment, deck, or backyard with sound. It blanketed my basement with music, and served as a good companion when doing yard work outdoors. 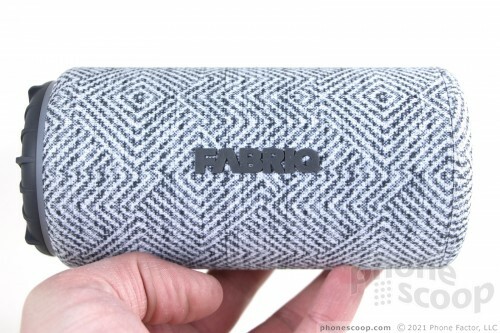 The volume is fine, but the quality isn't as impressive as that of the smaller Fabriq speaker. Acoustic and symphonic music sounded pretty good via the Chorus, but anything electronic came across as somewhat harsh at times. Rock, metal, and pop had a mid-heavy sound that I sometimes didn't care for. There is no way to adjust the speaker's EQ, so you have to rely on the tools in your favorite music app. The Chorus is fine for basic listening when moving around, but it doesn't produce super high-quality music. Battery life is not as good as the competition's. 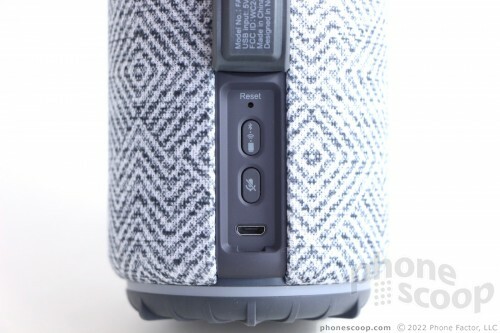 The speaker is rated for up to 6 hours of music playback. That's definitely the upper limit, and even then is only possible if you turn off the Alexa microphone. With the mic on, you'll see closer to 5 hours of battery life from the Chorus. This is mitigated somewhat by the convenience of the base charger. The Fabriq Chorus has several notable improvements over the original that make it a compelling option. First, the always-on mic means Alexa is constantly at your beck and call. I really like the ability to blurt out commands spontaneously. The larger size means bigger sound, even if the quality isn't quite as impressive. Beyond Alexa, the Chorus' WiFi support gives it a leg up on Bluetooth-only speakers. For example, you can cast your Amazon Prime music through the Chorus and still access all of your phone's features without interrupting playback. At $99 I think the Fabriq Chorus is priced competitively. It doesn't pack as clean a punch as some offerings from UE or JBL, but Alexa and WiFi casting make it more flexible. The Chorus sings its own praises quite well. The Fabriq is a Bluetooth speaker that works with Amazon's Alexa voice-powered assistant. The Fabriq is not as powerful as a full-fledged Amazon Echo, but it's a heck of a lot more portable. Amazon today made Alexa, its artificial intelligence, available to a much wider selection of devices by adding Alexa to its iOS mobile shopping application. Now any iPhone with the Amazon app aboard has access to Alexa, allowing people to search for and buy goods simply by asking Alexa for it. Today at 3pm ET, users of the Huawei Mate 9 will be able to update their phones over the air to support Amazon's Alexa voice assistant. The Mate 9 is the first phone to have built-in access to Alexa On The Go. Motorola today announced the Moto Smart Speaker with Amazon Alexa, a new modular attachment that lets Moto Z owners access Alexa when on the go. 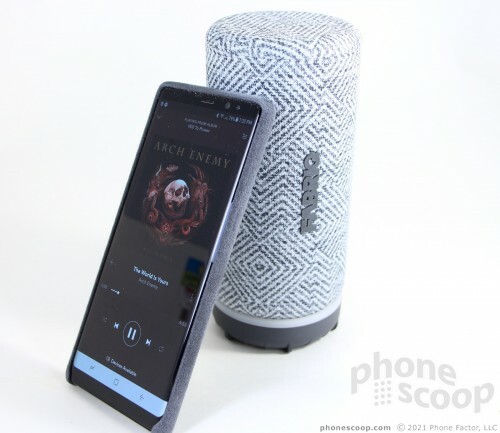 The Smart Speaker includes four microphones and Motorola says it can detect voices and respond to requests in most environments. Amazon today made the Motorola Moto Z3 Play and Moto G6 Play, both with Alexa on board, available through its Prime Exclusives program. Phones sold through the Prime Exclusive program have a single sign-in for all Amazon services, such as Amazon Video and Amazon Music.